At a superficial level there is nothing new in the robot, its propulsion, or even the plant husbandry and weeding equipment. The really clever technology lies in the identification and classification of the plants it will encounter. It is on the success or failure of this in real farm environments that the robot’s future will hinge. The university’s next step will be to take it on-farm, and the ABC report linked above has a wonderfully pithy quote from a farmer on the subject. You can see the machine in action in the video below the break. Farming robots have a significant following among the hardware hacker community, but it is possible that the machine-vision and plant-identifying abilities of this one would be beyond most hackers. However it is still an interesting project to watch, marking as it does a determined attempt to take the robot out of the lab and into real farm settings. Every project starts off with an idea. Sometimes those ideas are bigger than one person, or even a small group of people. 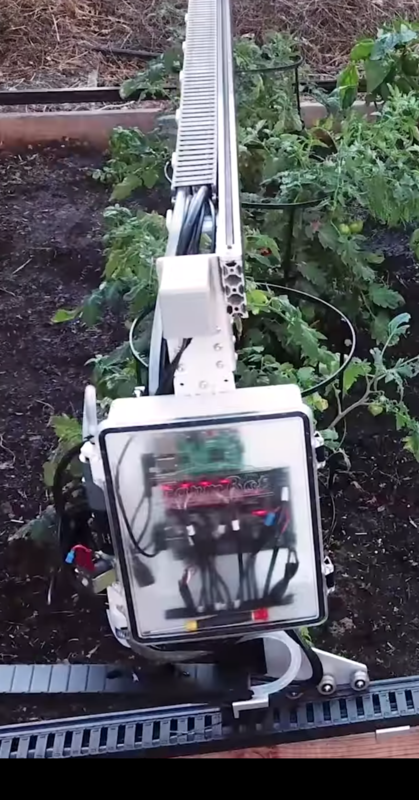 That was the position [Rory Aronson] found himself in with Farmbot, his finalist entry in the 2015 Hackaday Prize. Documentation was key for [Rory]. Farmbot first came into the world in the form of a white paper. The paper included a request for collaborators, making this an open source project from day 0. Documentation has been important throughout the Farmbot project, so it was naturally the topic of [Rory’s] talk at the 2015 Hackaday SuperConference.